PLEASE ANSWER ALL QUESTIONS ON THE APPLICATION AND PROVIDE THE REQUIRED REFERENCES. IF YOU DO NOT LIST PERSONAL REFERENCES AND YOUR VETERINARY REFERENCE (IF APPLICABLE), YOUR APPLICATION WILL NOT BE CONSIDERED. Please email completed applications to ordinarymiracles@att.net. OMCR does not operate on a first-come, first-served basis. All dogs are individually matched to the right home and family. While we try to work as quickly as possible, the adoption process can take anywhere from 3-7 days while we check references, conduct a phone interview and schedule a home visit. (3) current on heartworm preventative - proof required. You must be at least 21 years of age, have a stable job and home environment. Step 1 - The first step is the application which we ask you to complete and answer each question, providing three personal references, and a vet reference. Then email the application back to us. One of our volunteers will then call your references. Step 2 - The second step is a telephone interview which takes about 15 to 20 minutes. Step 3 - The third step is setting up a home visit with you. This is when we get to meet you and see where the puppy or dog will be living. We also want to be sure your yard is secure. Once the above are complete then you will meet the dog you are interested in or several dogs to find the right fit for you and your family. The process usually takes 3-4 days but can take a bit longer depending on the time it takes to reach your references. You can definitely get pre-approved if you're not quite ready to bring a dog into the family. Once you decide on a dog we collect the adoption fee and complete the necessary contracts. There is always a trial period to make sure everything is going to work out. We love to stay in contact for the life of our adopted dogs and will do occasional follow ups to be sure your new relationship is a joyful one. Your adopted dog will be spayed or neutered, up to date on their vaccinations, on heartworm preventative, dewormed and microchipped. Our adoption fee varies based on age and breed. Special contracts are available for puppies under the age of 5 months and heartworm positive dogs. Click on the link above to download our adoption application. Email the completed application to ordinarymiracles@att.net or send via U.S. Mail to P.O. Box 201612 , San Antonio , Texas 78220 . Why do I have to fill out an application before meeting a dog? Foster-based adoption groups care for rescued pets in private homes, not in a shelter setting. Foster groups are made up of animal-loving volunteers who fit animal rescue into their lives along with their many other responsibilities. Lastly, the phone number of a foster group (if it has one) may be the home phone of a working person or a parent. The group may not have funds or volunteers to staff a public phone, so it may take a few days to receive a response to your inquiry -- especially during the holidays. People new to adopting may not understand why we ask certain questions on our application. One question we ask is if the applicant owns or rents. If you rent, there are more than likely restrictions in the rental agreement regarding having a pet. First would be a pet deposit. Next would be size and breed of dog allowed. We have lost applicants who rent because they couldn't afford the pet deposit. Be glad we care enough about you and our rescue dogs that we want it to be a good forever match. You are adopting a family member! God bless! Adoption Fees - we're not making any money. Another misconception about rescues is that we are in it for the profit and that's why we ask for an adoption fee. All I can say is call a vet and find out how much they charge for their services for spay or neuter, vaccinations, heartworm test, deworming, and microchipping. And that's if they are healthy. Ask how much to fix a broken leg or jaw or to treat for heartworms. 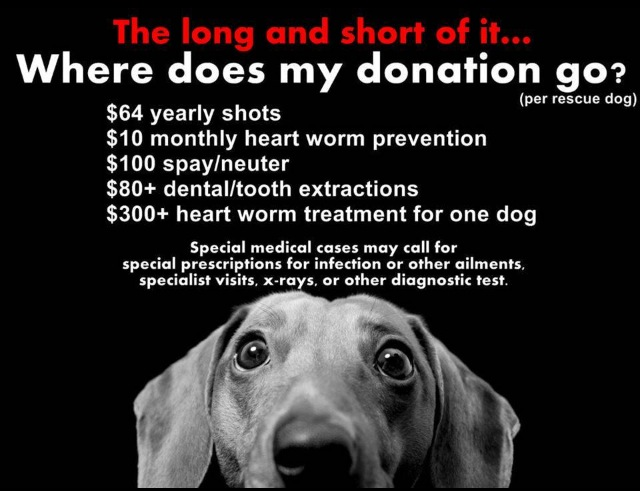 What does the heartworm prevention cost? Flea and tick prevention? And how much does it cost to board/house and feed the dog until the forever home is found? The cost to do what we do is ridiculous. The adoption fees we ask for are usually between $150 and $225 with a few exceptions. We would be so blessed if these fees covered everything we do for our dogs, but they don't. So we ask for donations, have fundraisers, and pay from our own pockets a lot. Ordinary Miracles rarely adopts a dog out of state, but if we decide to consider an out of state adoption there are several requirements. We must be able to find a fellow rescuer in your area to do a home visit. You and your family must be able to drive to San Antonio, Texas (preferably with your other dog(s)) to meet the dog. We do not ship dogs to adopters. Since our rescue is foster-home based we know each dog's personality and what you can expect from them. Our rescue dogs have all their veterinary care and most are crate-trained. We are here to answer any questions regarding the dog and will help you solve problems as they come up. Of course we love to hear from our adopted dog families for updates and happy stories as well! OMCR rescues dogs from abuse, neglect, euthanasia at shelters and as strays off the streets. There are not enough responsible homes for dogs and it is irresponsible and unethical to add to the surplus of unwanted dogs. All dogs adopted from OMCR must be spayed or neutered before an adoption can be completed.